OnePlus 6 equals a lot of phone for $529. With a new design and gorgeous screen, the OnePlus 6 is nearly impossible to pick out of a lineup among other 2018 premium phones. This superficial comparison doesn't quite hold up when you really study the phone, but one thing is certain: OnePlus has finally graduated from maverick to mature. The OnePlus 6 doens’t look like a $529 phone. 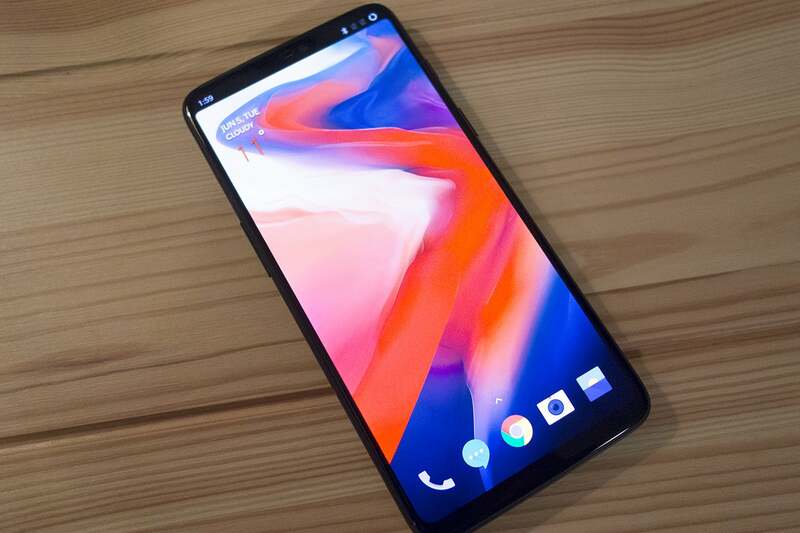 While previous OnePlus phones felt like they were living at least a half-year in the past—even the fantastic 5T, which ditched the home button and added an 18:9 screen, didn’t feel like a completely fresh phone when it launched after every other premium handset last year—the OnePlus 6 is right at home in mid-2018. From the gorgeous display to the stunning design and wonderfully minimal OS, everything about the OnePlus 6 feels like it’s on the cutting edge. Except for the price. As it was in the beginning with the OnePlus 1, the $529 OnePlus 6 costs about $300 less than similarly spec'ed handsets from LG, HTC, and Samsung. But for the first time, OnePlus has made a phone that is more than the sum of its parts. Not only are you getting a phone with top-of-the-line specs, you’re also getting a design and an experience that's every bit as premium as higher-priced competitors. Put the OnePlus 6 alongside the Galaxy S9 and the LG G7, and most people would assume all three phones cost $700 or $800. (I actually tried this very test and my unsuspecting iPhone X-using subject not only guessed $800, but also pegged the OnePlus 6 as the most expensive of the three.) It’s got a giant 6.28-inch 19:9 display, extremely slim bezels, and an elegant glass back—all firsts for OnePlus. The switch from aluminum to glass makes it more slippery and attractive to fingerprints than prior models, but the OnePlus 6 isn’t just the company’s best-looking handset to date, it’s my favorite phone design of the year so far. When the notch is hidden, the OnePlus 6’s OLED screen blends seamlesssly into its edges. 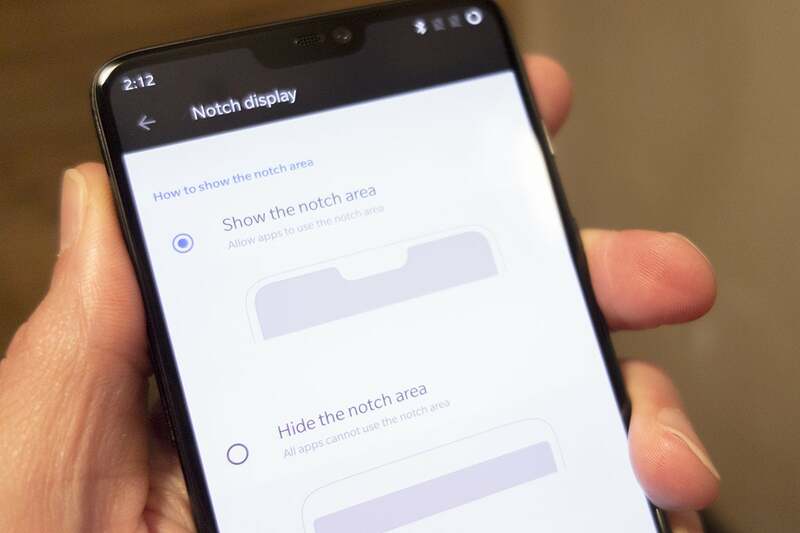 In order to get the display so big without dramatically increasing the size of the phone, OnePlus added a notch to the top of the screen like the G7, Huawei P20, and a host of lesser Android phones. It doesn’t, however, feel like a me-too feature here. 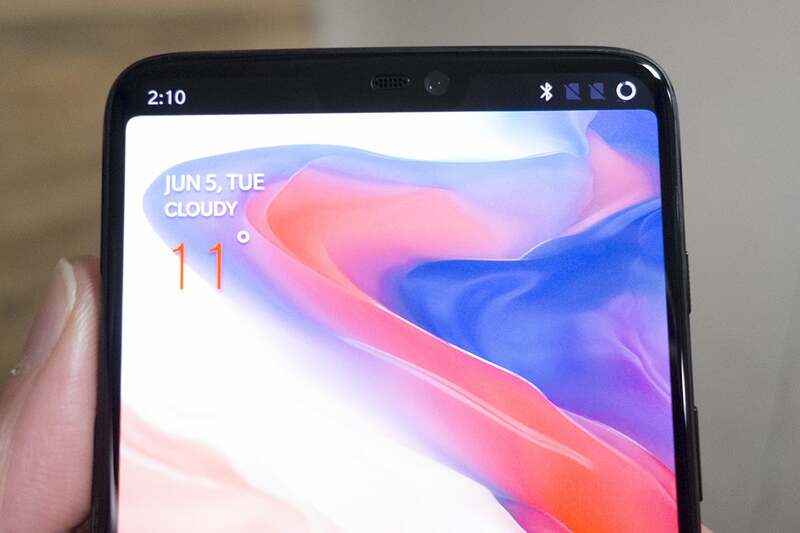 The OnePlus 6’s notch is the best implementation of the camera cutout since the iPhone X, and while the trademark Android chin is on full display (Apple’s internally flexible OLED is too expensive to replicate at this price point), the notch is shallow enough to fit a normal status bar, and the optional blackout mode looks far better on the OnePlus 6’s OLED than the LG G7’s LCD. I don't like the camera bump on the back, but even there, OnePlus has moved it to the center above the fingerprint scanner, so it’s not as distracting as it is on the 5T. Plenty of people will lament switching the back from aluminun to more-fragile glass. Ditto the addition of the all-too-trendy notch, and the lack of IP-rated water resistance. Nonetheless, there’s an attention to detail here that’s generally reserved for the highest-end phones. From its screen-to-body ratio to its alert slider that quickly lets you turn on vibrate, the OnePlus 6 delivers high-end craftsmanship and attention to detail the likes of which I’ve seen in precious few phones, let alone a mid-range phone. In short, OnePlus is nearing Apple and Samsung territory with the 6. The OnePlus 6’s display isn’t just bigger than nearly every other Android phone this side of the 6.3-inch Note 8, it’s also brighter and crisper, with extremely accurate colors. When blocking out the notch, the OLED seamlessly blends into the glass bezels, making it invisible in all but the brightest lighting. Side-by-side with my Pixel phone on its Saturated setting, the OnePus 6’s screen is both bolder and more vibrant (with greater customization options to boot), and the white’s were much cleaner. My only quibble is the lack of an always-on display, but the raise-to-wake feature worked well. You can hide the notch on the OnePlus 6. And the refreshingly lean OS makes the OnePlus 6 feel faster than the Pixel too. Of course, part of that is due to the Snapdragon 845 processor in the OnePlus 6, which is a generation newer than the Pixel’s 835 chip and about 15 percent faster in benchmark tests. But even when compared to its peers with the same processor, the OnePlus 6 offers one of the lightest, speediest, and purest Android experiences this side of a Nexus phone. Battery-wise, the OnePlus 6 is a winner as well. Its 3,300mAh battery is the same size as the OnePlus 5T, but it lasts just as long despite the bigger screen. My benchmark tests placed it at nearly 10 hours and I had no problem getting through a full day and then some. And as always, the bundled Dash charger did an excellent job filling it up quickly. 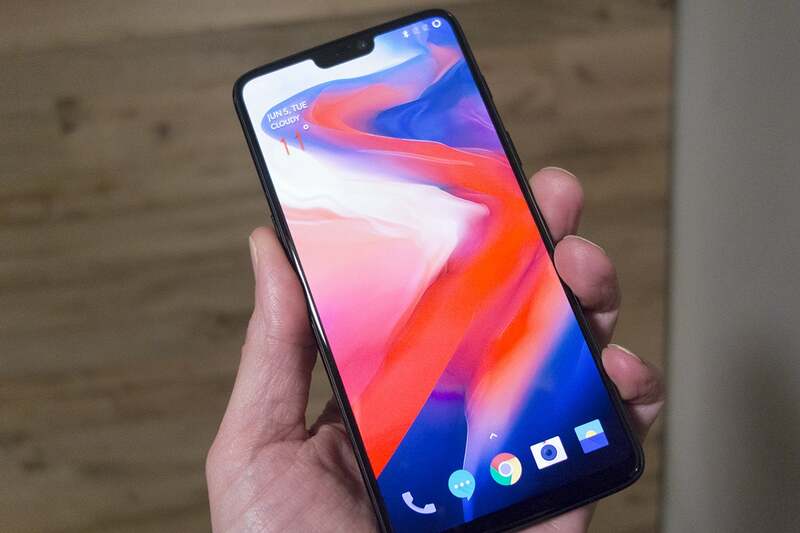 This isn’t the first time I’ve used this pun, but OxygenOS really is a breath of fresh air, and it has played no small part in OnePlus’s success. In many ways, the OnePlus is the closest thing to a Nexus you can get on a non-Android One phone, as even Google adds its own custom launcher over the top of Oreo on the Pixel. Like Samsung and LG, OnePlus adds plenty of features and settings to Oreo, but there’s very little bloat and redundancy, and you don’t need to dig through a mound of settings to find the one your want. 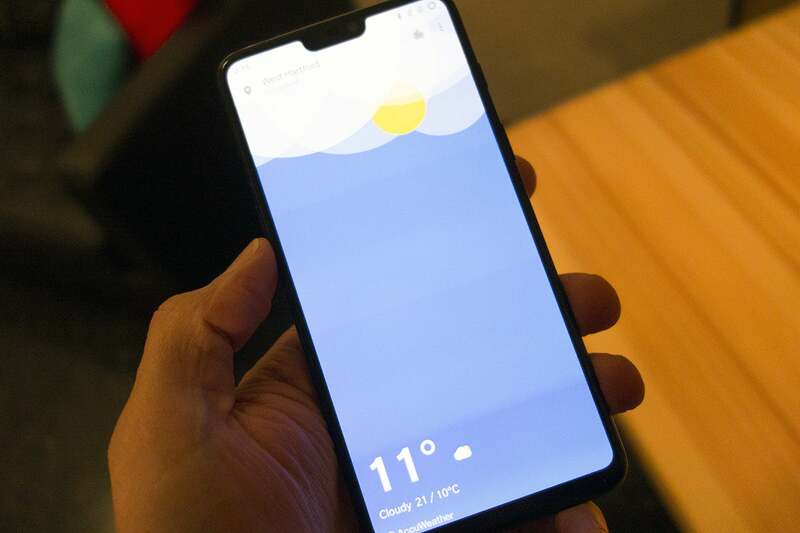 The OnePlus 6 is one of the few Android phones to include a weather app, and it looks great. My only real complaint is with gesture navigation. Like Android P, OnePlus offers the option to dump the navigation bar in favor of a swiping and scrolling system, but somehow it’s less intuitive than it is on the P beta, which is saying something. For example, to go back a screen, you need to swipe up from the left or right of the bottom of the screen rather than simply swiping right. But thankfully, you can just turn this off if it’s not to your liking. Overall, the features OnePlus has added elevate the experience unlike any other mod or skin I’ve used, and it makes more expensive phones look like even cheaper imitations of Android. I almost hate to say it, but if I could put OxygenOS on my Pixel phone, I would. The only question that remains is whether Project Treble will help OnePlus push out speedier updates, but the fact that you can already install the P beta suggests it has. The cameras on OnePlus phones have always been sore spots, mainly because the rest of the phones' specs have been so good. The OnePlus 6 won’t fully silence those criticisms, but the camera on this phone doesn’t feel like a mid-range fallback anymore, even if it isn’t quite on the level of the Pixel 2. The camera app on the OnePlus 6 looks minimal, but it hides a great set of pro tools. OnePlus has stuck with its 16MP/20MP dual-camera array on the 6, though the company says the pixels are nearly 20 percent bigger than in the 5T. It’s also brought back optical image stabilization (which was on the 3T and removed from the 5 and 5T), though the secondary camera has even less to do this time around. It’s not a telephoto lens (like on the 5) or a low-light lens (like on the 5T), and as far as I can tell, it’s strictly used for portraits, which seems like a waste. There aren’t even any fancy features like the Galaxy S9’s Live Focus or the HTC U12+’s selective focus at play here. Portraits on the OnePlus 6 are improved over the 5T, with less soft edges, but there’s nothing that will blow you away. The OnePlus 6’s optical image stabalization helped it capture motion shots as well as the Pixel 2 XL (right) and had less blurry spots than the Galaxy S9 (center). Dual camera capabilities aside, however, the 6 is OnePlus’s best camera yet, with zero lag, excellent focusing, and true-to-life color. Its app appears to be as minimal as the Pixel’s, but it hides a fantastic set of pro controls as well as a slow-motion mode (though it’s only 480 fps at 720p and 240 fps at 1080p). The OIS helps it capture motion and low-light photos nearly as well as its top-tier competitors. It still struggled mightily in ultra harsh lighting, but overall, the OnePlus 6 has an extremely capable camera that will be able to grab great shots quickly. In super low light, the OnePlus 6 (left) didn’t pick up as much detail as the Galaxy S9 (center) or Pixel 2 XL (right), but it did better than previous OnePlus phones. We’ll be running the OnePlus 6 through a battery of tests as part of our Last Cam Standing series, so stay tuned to see if it can unseat the current champ, Huawei’s Mate 10 Pro. Should you buy a OnePlus 6? The OnePlus 6 is the first GSM phone I’ve used that made me consider switching from Verizon to T-Mobile. 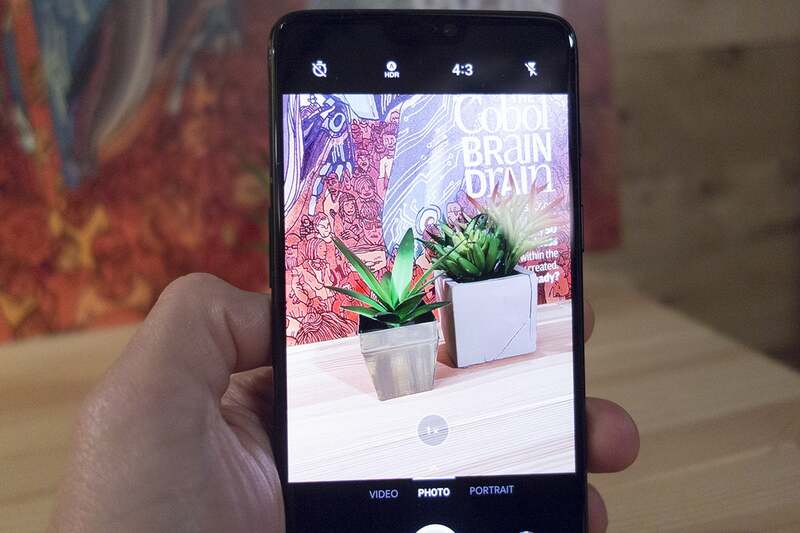 That’s not to say it’s perfect or even better than the Pixel 2 XL or Galaxy S9, but with its seventh flagship in four years, OnePlus has shown that its smartphone vision isn’t just about top-notch components at a fair price. That’s a 6.28-inch screen on the OnePlus 6... with a notch. There’s a sense of culmination with the OnePlus 6—like, now on its seventh phone, OnePlus has figured something out. The lack of water resistance and wireless charging is still a bummer (the latter of which is made more glaring by the glass back). It also has limited carrier support, but its speed and elegance is unsurpassed for a phone at this price-point. And if the 6T follows OnePlus's usual upgrade cycle, Samsung and Google might have a real fight on their hands in sixth months. Gorgeous screen and design make this the best-looking OnePlus phone yet. Incredible speed and excellent battery life. You can't get these specs and this screen for anywhere near this price. No wireless charging or IP-rated water resistance. While the camera is much improved, it's still not on the level of Samsung and Google.